"Best Album 2011" Kids Music Awards: Fun, smart, "delightfully wacky" and soothing all at the same time, this project was done by a creative dad for his kids. This collection of refreshingly original music is a winner with kids, parents and teachers. 1. I've Got a Dinosaur on My Head! 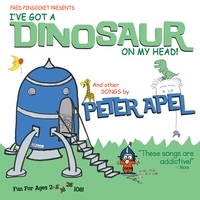 Peter Apel’s award-winning music CD “I’ve Got a Dinosaur on My Head!” was released after constant urging from friends and family who loved his music and thought it should be heard beyond his living room. Apel's songs are said to have a magic simplicity, offering keen but subtle observations of people and life.